Aspen Le Bistro Gravity Pet Feeder Review - Does It Work? (3.2/5)With Aspen Le Bistro Gravity Pet feeder your cat has food available at all times. With its gravity system, the food drops as your cat eats and it relieves you from pouring food into a bowl every day. Made from PET plastic (safe, recyclable plastic that does not contain PBA), which is healthier for your cat and more environmentally friendly than those feeders made from PVC. The feeder total capacity is 2 lbs, which makes this unit more suitable for small pets, such as cats and small dogs. The bowl’s capacity is approximately 1 cup of dry food. This particular size of Aspen Le Bistro Gravity feeder (2 lbs capacity) comes in several colors, such as Breeze, Pink or Navy. 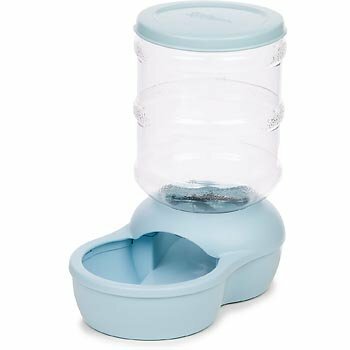 The bigger size of 5 lbs food capacity for larger pets comes in similar colors as well. This review is for Aspen Le Bistro Gravity feeder 2 lbs capacity, suitable for cats and small dogs. Comes in colors: Navy, Pink, Breeze, Bleached Linen. WHAT ARE THE PROS AND CONS OF ASPEN LE BISTRO GRAVITY FEEDER? Bowl size it’s on the small side for larger dogs, good size for cats. The feeder seems to work better with small round or flat kibble as it allows the food to flow better down to the bowl. Very small round or flat kibble make the gravity system work better. Some cats figure out that if they stick their paws in the feeder reaching upwards at the kibble stuck in the chute, more food will drop so they can keep eating. Other felines push the bowl around until food drops into the bowl. If your kitty is smart enough to do any of these actions he or she will keep eating no matter what; consequently the lack of food-flow won’t be an issue. You can match this feeder with the Aspen Le Bistro waterer. Aspen Le Bistro Gravity Pet Feeder is a good alternative to feed your cat with a gravity feeder and for a good price. Gravity feeders help you from having to pour food into the bowls every day which could be annoying to cat owners. This particular size is special to feed small pets; the unit is smaller than what it looks in the picture. The bowl is narrow as well. If you don’t want to pour food in your cat’s bowl everyday and are willing to supervise the feeder.